Many amateur operators will use a handheld radio for communications on the 2 m and 70 cm bands, usually just using the “rubber ducky” antenna supplied with the radio. Many knowledgeable operators refer to these antennas as “dummy loads”, making reference to the fact that the small antenna length compared to a half wave at 2 m will result in a relatively poorly performing antenna. Many will choose to build or buy an antenna for the handheld. One can purchase a commercially built antenna that is close to a quarter wavelength for 2 m at around $60 RRP, or even less if you purchase of the well-known site on the internet and wait for the delivery to arrive from China. Such antennas will probably perform better than the rubber duck whip, given that they are closer to a full-size antenna. The downfall is that the counterpoise (or radial equivalent) is small – the chassis and/or pcb of the radio itself, probably with some capacitive coupling to the hand/arm/body of the operator. Several operators have reported better performance, even with the rubber duck antenna, by adding a counterpoise wire to the earth side of the antenna connector. I decided to build something very simple yet lightweight, based on a commercial antenna that I had several years ago before it went into service at an emergency operations base. The commercial antenna was a vertical half-wave antenna, fed from the bottom of the antenna, with the antenna wire inside a fibreglass radome. The antenna was purchased at low cost as part of a surplus sale. The only downside was that it was built for a frequency below the 2 m amateur band, so needed modification: it needed to be shortened to make it work at 146 MHz. On dismantling the antenna to perform the modifications, I saw that it was built from a single length of small diameter Teflon coaxial cable. The antenna portion consisted of a quarter wave section of cable with the outer covering and shield removed – just the inner conductor and surrounding insulation – then a quarter wave (approximately) of unmodified coaxial cable. At the end of the half wave of cable there was a simple choke wound on a plastic former, followed by a further short length of the coax that terminated at the bottom RF connector. It was simple – a single length of coaxial cable, with some of the outer and shield removed at the top, and then a choke would using the cable around a former. 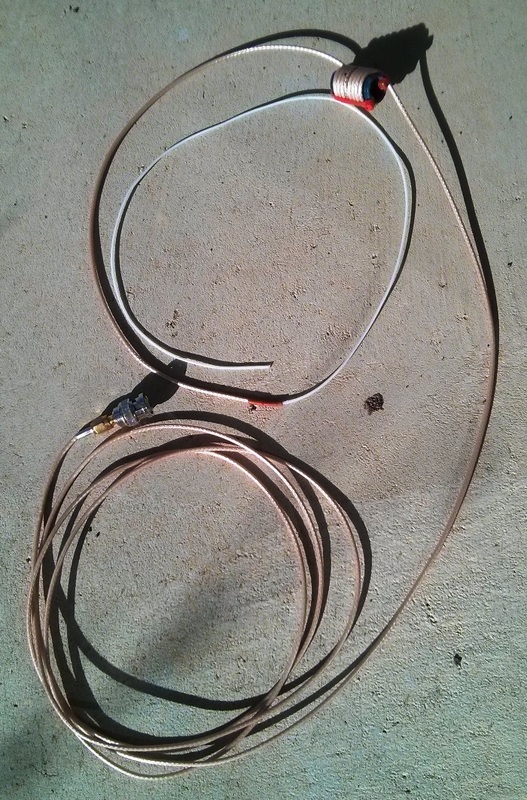 If you consider these facts, you can see that it is working just like a “bazooka” balun end-fed antenna: The top section of inner conductor is the top radiator; the next quarter-wave is the other half of the half-wave dipole, with the RF current running on the outside of the coaxial cable shield. The choke presents a high impedance to the current flowing on the outside of the shield, so stops that current from flowing further down the outside of the coax. So we have a simple end-fed half-wave dipole. Hopefully that description is enough to give you the idea. The photo below should be clear enough to see what is happening…. Start with a convenient length of RG316 Teflon cable – long enough for the antenna, the choke and a convenient length of coax to connect to the radio. I used a length of approximately 3 m, purchased for a few dollars at a hamfest event, terminated at one end with a SMA male connector – perfect for my handheld radio. Carefully measure 510 mm from the far end of the coax from the connector and make a mark on the outside of the coax. Note that it might be worth considering adding an extra few centimetres or so for a couple of reasons: to allow for trimming the antenna to the required length, plus some to fold over at the end of the antenna to make a small loop so that you can tie a support line to tie the antenna to a support – tree branch or perhaps a squid pole. Measure and make another mark at 870 mm from the end. With a sharp edge, carefully cut through the outer insulation of the cable at the first mark you made, then remove the outer insulation from the top 510 mm of the cable. Having removed the outer insulation, carefully cut through the shield of the cable at the same point that you made you first cut. You want to avoid cutting the inner insulation, as doing so would introduce a point of weakness on the inner portion. Remove the shield from the coax – put it into the junk box for use down the track – it is usually silver plated copper. Find a 30 mm section of plastic or fibreglass tube of approximately 15 mm diameter – I used a section of a broken cross-country ski pole. After cutting your length of tubing, smooth the edges at both ends. Drill a single 3 mm hole at least 4 mm in from the end of the tubing. Feed a small cable tie through the hole and then cable tie the coaxial cable down to the outside of the tubing, with the second mark just under the cable tie. Now wind the coax around the former for 8 turns, close-wound. I temporarily taped the assembly at this point, and then drilled another 3 mm hole for a second cable tie. Once drilled, feed through the second cable tie and then secure the second end of the coax choke coil with the cable tie. You are now all done, other than trimming the excess cable tie material and trimming the antenna to length. Careful trimming will result in an antenna which is usable across both the FM and SSB segments of the 2 m band. I added a small section of heat-shrink tubing over the area where the coaxial cable outer and shield were trimmed in a simple attempt to waterproof that area. The photo shows the antenna semi-packed. It has a SMA-BNC adapter connected, having been last used connected to the FT-817. The antenna can be wound into a loose coil and has a mass, in my case, of 60 grams, including the adapter.